This web template is ideal if your company offers legal services to businesses, private individuals and families. You can edit, add and remove pages according to the needs of your legal practice. 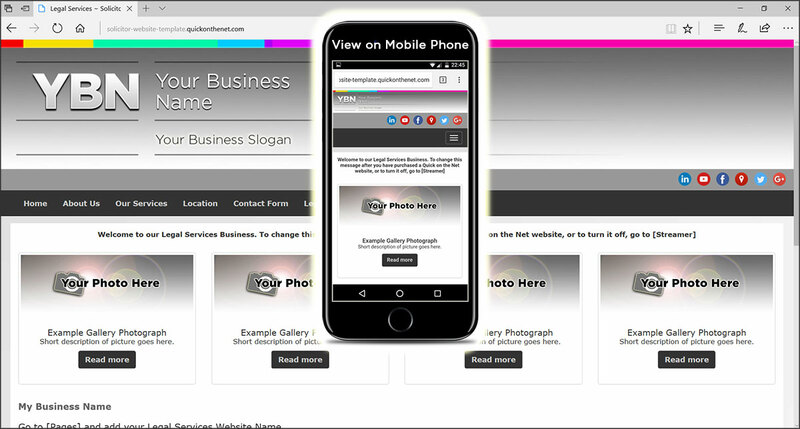 Your new business website is supplied with a search bar. So, this means that the information you add to your website is completely searchable, based on the keywords you add to each page. What's more, the information can also be indexed and searched on external search engines, such as Google, Yahoo and Bing (Live / MSN). Follow our SEO tips, optimise this site for search engines and then monitor your progress using Google Analytics. As regards your specific business, we have created a stylish "word mark" logo to sit at the top and bottom of the screen area. Where it says 'YBN' and 'Your Business Name', we would obviously replace that wording with the actual name of your business. As with all our websites, if you already have a company logo, you can brand (re-brand) this site and modify the design to suit your business needs.